Here's a first- the inclusion of female players in a major sports release form EA Sports. The female stars that'll be on the roster for EA Sports' NHL 13 will of the Olympian variety- and they won't be alone as a whole new cast of Hockey Legends will be playable too. And not only will two of the greatest women's Hockey players ever be represented in the game as playable characters, but Team USA's Angela Ruggiero and Team Canada's Hayley Wickenheiser have also hand selected full teams that will be playable in the game. Legends Integration in NHL 13 Legends in NHL 13 will be integrated across several modes: · Be A Legend – gamers will experience the glory of playing their entire Be A Pro career as a legend as they attempt to shatter the most impressive records in hockey, achieve legendary milestones and complete legends tasks. · Legends teams – Play as the legends team, Team Ruggiero or Team Wickenheiser, which are comprised of legends and current NHL greats in head-to-head play – within Play Now, Online and Battle for the Cup modes. Players on Team Ruggiero and Team Wickenheiser were selected by each athlete, respectively. 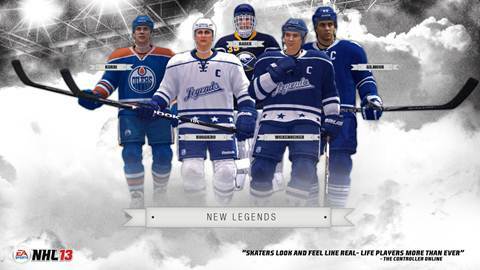 · Hockey Ultimate Team & Be a GM – Gamers will have the ability to add legends to any team roster in Be a GM mode, or collect ultra-rare legends cards and use them within their Hockey Ultimate Team experience. Headlined by all-new True Performance Skating, and supported by an innovative new A.I. system dubbed EA SPORTS Hockey I.Q., NHL 13 will deliver a revamped gameplay experience that accurately captures the speed, creativity and strategy of NHL hockey. In addition, NHL 13 will also deliver new experiences that connect hockey fans to their friends and the real world of hockey with the all-new GM Connected and NHL Moments Live modes. Look for NHL 13 on store shelves on September 11th in the US and September 14th in europe.